THE CONTENTS: No. 7 Duke battles Duquesne at 3 p.m. at Cameron Indoor Stadium today. You can see the game on ESPN with Bob Picozzi and Jimmy Dykes and hear it on 620 AM. THE EXPOSITION: Duke (6-0) got a much-needed break after playing four games in eight days. The Blue Devils are coming off their 78-58 victory over Montana. Duquesne (4-0) hasn’t exactly played top-flight competition yet. The Dukes have defeated High Point, Saint Francis (PA), Furman, and South Carolina Upstate. Duquesne was picked to finish 12th in the 14-team Atlantic-10 (that’s a lot of numbers). For context, Rhode Island was picked to finish ninth. It is the first Dukes game to be televised nationally since 1995. Duke is 4-1 all-time against Duquesne, including a 3-0 mark in Durham. Check out a photo slideshow of Saturday’s Blue-White scrimmage by following this link. 1. Nolan Smith is ready to lead the Duke offense. After playing a complementary role in conducting the trio of Scheyer-Henderson-Singler in this first half, he took control in the second with a lineup that wasn’t as offensively minded and still thrived, this time as a scorer. He should get equivalent playing time to Greg Paulus, and we might even see more of the two of them together, especially after the Blue team ran a quasi-two point guard set with Smith and Jordan Davidson in the second period. 2. Pocius has recovered well from the ankle injury that sidelined him most of last season. He looked mobile, was an effective scorer in the second half, and played his role well without rushing any shots, Krzyzewski said. Expect the junior to compete for minutes at the guard position like he did last year before he went down against Eastern Kentucky. 3. Miles Plumlee was the most comfortable freshman out there. 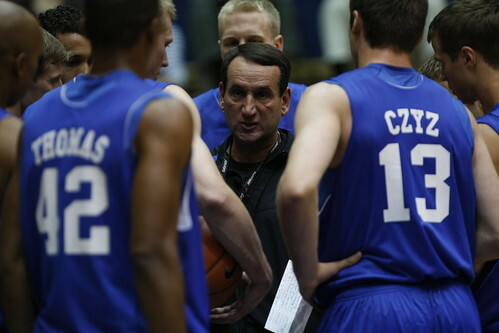 Krzyzewski said that he protected the basket, ran the floor well, moved well without the ball and had good hands. Defensively, he helped take Singler out of his rhythm in the second half. All of the freshman will have a learning curve, but Plumlee looked the most game-ready. Olek Czyz didn’t see much playing time, and Elliot Williams had the unenviable task of guarding the red-hot Henderson in the first half and Smith in the second half. 4. Krzyzewski was most effusive in his praise for Smith, who he said “played as well as anyone”, but also commended Dave McClure’s defense-particularly in the second half on Henderson-and Pocius’s veteran presence. 79-70 Blue, END OF SECOND HALF: And that’s a wrap. The second half took a significantly different trajectory than the first and with a different result. Pocius and Nolan Smith were the high scorers will 11 points apiece in the second session and Smith, David McClure and Miles Plumlee were the three Blue Devils to win both “games”. Postgame recap and quotes to follow. Check out The Chronicle’s photo slideshow from Friday’s open practice by following this link. When he’s not going by King, LeBron James has been dubbed The Chosen One—or at least, he has since Sports Illustrated pegged him with that title when the King-in-waiting was only a high school junior in 2002. Duke head coach Mike Krzyzewski coached James this summer as he guided Team USA to a gold medal in the Beijing Olympics. One day, he told students at “Have a Coke with Coach Cut” Wednesday in the Great Hall, Krzyzewski was talking with James and the superstar had his shirt off, showing off the tattoo on his back that reads “The Chosen One.” Krzyzewski noticed the body ink and asked if he could get a tattoo of the same ilk. “Coach, I really like you a lot, but no one would choose you,” Krzyzewski recalled James saying to the delight of the approximately 200 students in attendance. When David Cutcliffe meets with students Wedneday to break down game film and sip Coca-Colas, he will be accompanied by the only coach more prominent than he is: Mike Krzyzewski. Coach K himself will join Cutcliffe in the Great Hall for soda and nachos at 8 p.m. Both he and Cutcliffe will take questions from the gathered students (no word on whether Krzyzewski will analyze football film). Krzyzewski’s squad tips its season Saturday with the annual Blue-White intrasquad scrimmage at 1 p.m. preceding Cutcliffe’s team’s home game against Miami at 3:30 p.m. Krzyzewski will open his practice to the public Friday at 5 p.m.